Similr is a tool that crawls Flickr photostreams for photos that are similar to the ones that you already like. 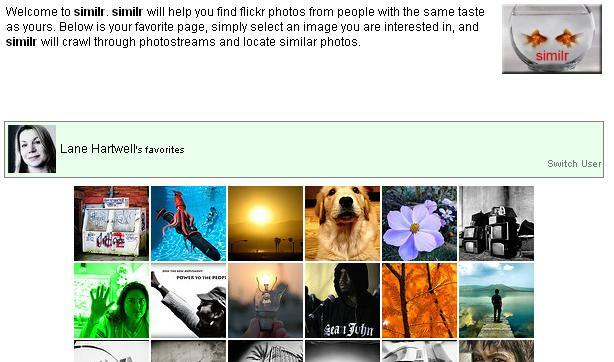 It will first ask you for a flickr user; you can write in any user, not just yours. It will then load all of that user’s favorite photos and will allow you to select one of those. When you do so, it will crawl flickr’s photos, and look for favorites of contacts who also favored the photo you just selected. Complicated? Just try it out, but be warned, it’s very addictive. You can also enter an email address to start off. It can be hit or miss, but if you trust the taste and judgement of the user, then it's an easy way to filter out all the photos lacking interestingness to you.